The Columbia County Sheriff's Office Emergency Response Team (ERT) was founded in late 1988 and early 1989. The presence of a highly-trained, highly-skilled law enforcement tactical unit has been shown to substantially reduce the risk of injury or loss of life to citizens, law enforcement officers, and suspects. A well-managed team response usually results in quicker and more successful resolutions to critical incidents. It is the intent of the Columbia County Sheriff’s Office ERT to provide a highly-trained and skilled tactical unit as a resource for the law enforcement agencies and citizens of Columbia County. The ERT began after an early 1970's riot team was transformed into the current ERT. In 1991, the ERT was trained by the FBI in modern tactics for search and rescue as well as the use of special weapons and tactics. The team has continued to receive regular monthly training to prepare its members to safely resolve high-risk situations. Some situations the ERT may face include high-risk, barricaded person and persons using threats, weapons and/or hostages to avoid contact with law enforcement. The ERT also is called on to serve high-risk warrants and crowd control situations. The ERT trains to meet these high-risk challenges through the use of individual defensive tactics, automated robotics, less-lethal tactics including irritating gas, electronic stun guns, K-9's, beanbags, and when other force options have been precluded, lethal options. The ERT must also train to meet these challenges wherever they may occur such as in a structure, wooded area, or a vehicle. The ERT currently is a multijurisdictional team comprised of 16 members from the Columbia County Sheriff’s Office, Wisconsin Dells Police Department, and Lodi Police Department. 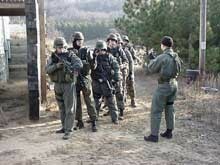 The ERT consists of a Team Commander, Team Leader, Assistant Team Leader, Snipers and Entry/Containment personnel. The team is a voluntary position within the Sheriff's Office with no additional pay for belonging. The ERT is supported by a Hostage Negotiator Team and Tactical EMS (TEMS) personnel. In 2001, the ERT was given approval for a Tactical Emergency Medical Unit to be formed to assist the ERT with close medical support in call outs and in training. Currently the ERT has three paramedics assigned to the team from Dells / Delton EMS. Assignment to the team is a voluntary position for the paramedics increasing their knowledge and skill level by working in a tactical environment providing immediate medical assistance.The TEMS have assisted with calls out in Columbia, Adams and Sauk Counties, as well as the City of Madison. In the mid 1990’s, the ERT was able to obtain a retired armored truck for $10.00. The vehicle has served well over the years as a protective barrier to deploy the ERT to extract/evacuate people from volatile tactical situations. In 2015, the ERT was able to obtain at no cost an Emergency Response Vehicle (ERV) with greater protective abilities than the armored truck could afford. This “new” ERV has already been deployed in situations to protect members from potential violent threats and inclimate weather. The members of the ERT are on call for emergency situations 24 hours a day, 365 days a year. The members are on a pager system, which provides for a rapid response in emergencies. For more information call or e-mail Sgt Todd Wagner (608) 742-4166 or Todd Wagner.